Oakland residents and tenants rights organizers at Causa Justa’s West Oakland office. On Saturday, April 2, 2016, members of Causa Justa, AACE (Alliance of Californians for Community Empowerment), Oakland Tenants Union, SEIU 1021, and other organizations, as well as Vice Mayor Rebecca Kaplan and many Oakland residents who are affected by the housing crisis, gathered at Causa Justa’s West Oakland office to kick off signature collection for proposed ordinance Renters Upgrade, in an effort to place it on the November ballot. Hold the city accountable for more effectively enforcing existing legal tenant protections. Renters Upgrade requires 33,000 signatures to qualify for the November ballot. “I want Oakland to keep its soul. I want us to fight for Oakland’s soul. I want Oakland to be the same city that lured my mother to it from Arkansas many years ago,” said Chris Jackson, a leader with AACE, Oakland resident and father. Jackson talked about how and why Oakland is so at risk. The median income of the average renter in Oakland is $40,000 per year. Young people flocking to the city, having just taken jobs with major tech companies in San Francisco and other areas, have annual incomes that far exceed that of those who are already here. That is what Renters Upgrade is all about: protecting those who already call Oakland their home and ensuring that they may continue to do so. Protecting families who have lived here for years, and, in some cases, even generations, from displacement, eviction and/or unmanageable rent hikes. Councilperson Rebecca Kaplan took the mic next. Before becoming Oakland’s City Council representative, Kaplan was a tenants’ rights organizer and activist, working alongside Causa Justa in passing the first Just Cause law in 2002. “Many don’t realize that many of the evictions taking place are already illegal,” said Kaplan. The issue has been a lack of funding for— and, perhaps, commitment to— enforcing existing laws. Kaplan and others fought the city for more funding toward this end, and they won the fight— on paper. Unfortunately, however, the city has yet to release the funds it has promised. One of the major issues facing Oakland renters today is not only the lack of enforcement of the Just Cause law but also the fact that newer buildings— those built after 1983— are exempt from this and other tenant protections. The ordinance to Protect Oakland Renters (Renter’s Upgrade) addresses this issue, eliminating these exemptions so that tenants of condos and other newer buildings can be equally protected under the law as those who live in older buildings. When the speakers had finished, residents split off into two groups— one that would be canvassing houses door-to-door and another that would be posting up in high-traffic areas to speak to pedestrians about Renters Upgrade. 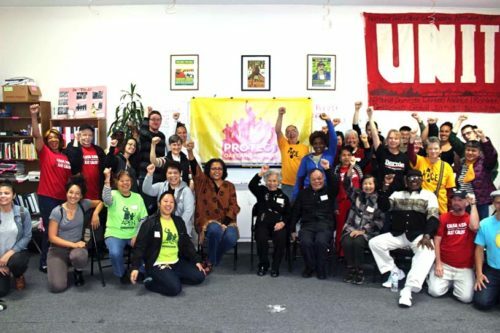 April 2nd was only the first of many, many Saturdays residents and organizers here in Oakland intend to spend taking Renters Upgrade to the streets. 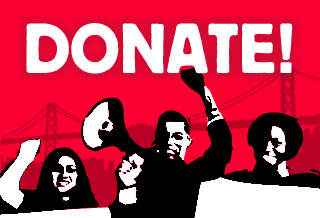 If you would like to get involved, contact becki@cjjc.org or visit www.ProtectOaklandRenters.org.